Welcome to the Archives Blog! Archives Blog ›› Website Updates ›› Welcome to the Archives Blog! Welcome! Archives.com is a new site destined to be a premier research site for both beginning and advanced family historians. 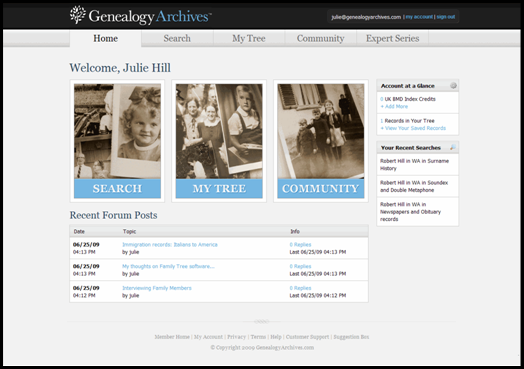 This blog is designed to be our direct connection with you, the genealogy community, who we hope will use and enjoy our site. Here you'll get the inside scoop on site updates and improvements, collection additions, partnerships, and more. About Archives: We set out in January 2009 with the goal of making online family history research easy and affordable. With over one billion records instantly accessible in the Members Area (find your ancestors and living relatives! ), the ability to save records and upload GEDCOM files, research tips from expert genealogists, and more, we think we're well on our way to greatness. Search - Search over one billion records in our extensive database. As a member you can access both domestic and international records, view original images, and save records to My Tree. My Tree - Your research repository. Keep yourself organized by uploading your GEDCOM, save records, or add your own! Community - We encourage you to interact with other members in the Community Forum. Post your latest findings, swap stories, or ask for help on puzzling research topics. Help us become even better by giving your feedback! We want to know what you like about the site so far, what needs improvement, and what features you'd like to see added. Email us your thoughts at: feedback@archives.com. Thanks for visiting, and check back in soon!